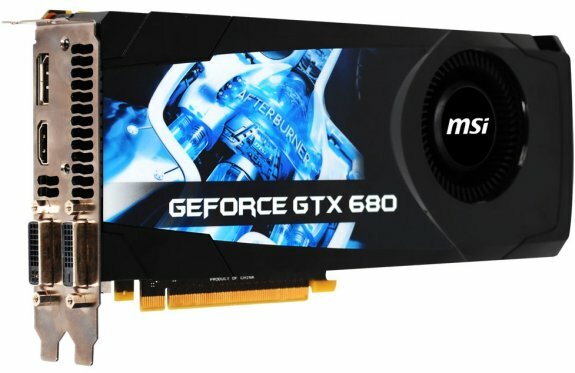 MSI outs its GeForce GTX 680, it has the same clockspeeds as the reference model (1006MHz core, 1058MHz Turbo boost, 6GHz GDDR5). Today leading international mainboard and graphics card maker MSI officially announces the new GeForce GTX 680 graphics card featuring the latest 28nm GeForce GTX 680 GPU and 2GB of GDDR5 memory. The GeForce GTX 680 graphics card is outfitted with the latest GPU that not only meets PCI Express 3.0 standards and supports DirectX 11 technology, but also features NVIDIA's GPU Boost technology. GPU Boost technology allows the core clock to be automatically adjusted on the fly for optimal gaming performance. When used with the MSI Afterburner overclocking utility, the power limit and clock offset can be adjusted as well for better overclocking capability. A single card can also support NVIDIA 3D Vision Surround technology for up to four monitors to give gamers the best gaming experience.